Accomplished Polish beat-maker Emapea has made memorable appearances on many Cold Busted label compilations -- such as in the IWYMI and Bust Free series -- and has been selected for inclusion in Mark Farina's next Mushroom Jazz installment. 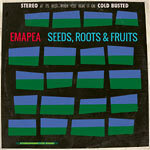 All this activity has mouths watering for the debut full length album from Emapea, and the appearance of Seeds, Roots & Fruits doesn't disappoint one bit. Featuring sixteen exceptional tracks ranging from hip hop to acid jazz to psychedelic trip hop in the style of Mo'Wax, Emapea's long player is indeed, as a wise man once said, ''a journey into sound.'' Seeds, Roots & Fruits rises above the average beats album to reveal the enduring depth of this young producer. Emapea is one to watch.